I joined Twickenham Vets in 2005. 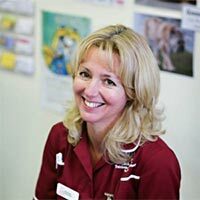 My job involves meeting and greeting clients and their pets, helping to look after inpatients, cleaning instruments and drapes after operations, and discharging patients. Stock control is also a large part of my job, but I particularly enjoy getting to interact with clients and their pets. At home I have two rescue dogs, three rescue cats, many fostered rabbits and am now fostering children as well!